Featured Series – Spotify: Streaming Numbers Put in Perspective. It’s no secret that Spotify is, and has for some time now been, the music streaming industry’s leader, as measured by paying subscribers, total users, revenues and otherwise. But most people may not recognize just how dominant the platform is, or how crazily valued it’s become. Or how fast it’s growing. Its user-driven innovations are well documented, and the platform itself is just really well conceived, as discussed in our post regarding its user interface, but it’s what Spotify is doing with artists and labels that’s really winning them the streaming war. This super comprehensive Fast Company article explores some of the ways in which it’s doing so, making reference to its superior analytics and economies of scale, among other things. The point is that Spotify is huge. And what’s more, its current pace of growth is faster than it’s ever been before, as the streaming service expands aggressively into new markets and continues to invest strongly into advertising within developed markets. Here are a few more fast facts for you, taken from the company’s press page: as of September 2016, a total of $5 billion had been paid out to rightsholders; over 30 million songs are on Spotify; and over 2 billion playlists have been created since its inception. One of the most interesting Spotify-published news items to come out this year was a report published just last week which highlighted the fact that not only are more people joining Spotify in the aggregate, (1) they’re streaming more music, period, and (2) they’re streaming a more diverse selection of music than ever before. People simply can’t get enough of streaming. And it’s largely attributable to the resurgence of the entire music industry that we’ve seen in the past few years, following an over decade-long downturn that saw companies all throughout the sector losing money virtually every year. Now, IFPI reports that streaming revenues grew by an astonishing 60.4% YOY in 2016, more than offsetting a 20.5% decline in downloads and a 7.6% decline in physical revenue. 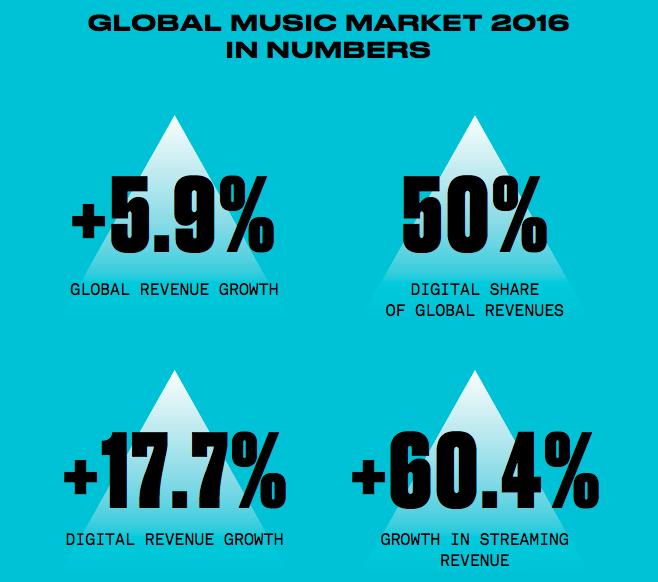 Indeed, overall growth in the recorded music market, bolstered by streaming gains, was 5.9% YOY in 2016 – the highest rate since IFPI began tracking the market in 1997. While it’s true that Spotify and other like services pay only fractions of a cent per individual stream, these fractions add up very quickly, especially for A-list artists whose monthly listeners are in the millions, and whose monthly play counts can be in the hundreds of millions. The above figure is the current, and absolutely staggering, valuation of the company, per CNBC. Talks of a Spotify initial price offering (“IPO”), or public stock exchange listing, have been looming for several months now, with many experts suggesting that the IPO will come in 2018. This would but add fuel to the fire as investments would no doubt pour in given then company’s allure and growth potential. Other streaming services like Apple Music, Deezer and SoundCloud remain important and relevant, but in Spotify, we could be seeing the rise of one of the biggest tech, let alone music streaming, companies in the world. Provided that it can become profitable, a subject we’ll touch on in another post, Spotify looks poised for an absolute global takeover. Either way, it should be fun to watch how this unfolds. Buckle your seatbelts.